Is gun ownership increasing in Australia? On Friday, Australia had its worst mass shooting since the nation overhauled its gun control laws more than 20 years ago. The suspected murder-suicide of a family of seven in Western Australia has inevitably revived discussion of the laws, often described as among the strongest in the world. Brought in following a 1996 massacre in Tasmania that killed 35 people, the legislation banned the use of automatic and semi-automatic weapons. It led to the destruction of more than one million guns. The country has had two mass shootings since 1996: the murder-suicide of a family of five in 2014, and the seven deaths at a rural property on Friday. However, as with debates overseas, opinions differ over what role gun laws have played in preventing or allowing tragedies, and whether changes are needed. 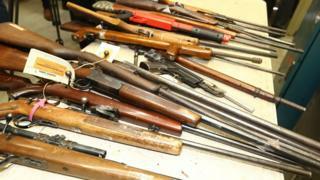 Firearms found at the scene in Western Australia appeared to be properly licensed, authorities have said. What are the ownership trends? Australians now own more guns in total than they did before the 1996 crackdown, according to figures from 2016 - the last time they were comprehensively studied. That amounts to more than three million firearms, according to separate government statistics. But gun ownership per capita has dropped by 23% during the same time, said Associate Prof Philip Alpers from the University of Sydney. "Far fewer people now have a gun in their home but some people have a lot more guns," Associate Prof Philip Alpers told the BBC. In the past 30 years, the number of households with at least one gun has declined by 75%. However, Associate Prof Alpers said that those who already own guns are buying more and registering them at a higher rate. What types of guns are in Australia? The 1996 reforms prohibited ordinary Australians from owning automatic and semi-automatic firearms, and pump-action shotguns. Of the millions of guns currently in circulation, "the great bulk" are legal, said Associate Prof Alpers. Last year, the government estimated that about 260,000 were illegal or unlicensed firearms, including 10,000 semi-automatic handguns. A national amnesty targeting the "grey market" - unregistered guns that were kept by households after 1996 - retrieved more than 57,000 firearms last year. Are shooting deaths on the decline? Yes, the number of gun-related homicides decreased by 57% between 1989-90 and 2013-14, according to the most recent official figures. The number of people who died from gunshot wounds dropped by 63% in the same period. Associate Prof Alpers said that the rate of gun-related crime had been "trending downwards since before 1996, but the rate of decline doubled after the law changes". Would Australia's gun laws help the US? "There has been no significant spikes or resurgence in gun crime," he said. Suicide accounts for the majority (70%) of gun deaths in Australia, Associate Prof Alpers said. Should there be greater restrictions? Although Australia's gun control debate is less heated than in nations like the US, such questions remain divisive. Last year, lobby group Gun Control Australia argued that gun control laws had been weakened by Australia's state governments since 1996. It said the erosions included looser requirements for certain gun licences and usage. The group asserted on Friday that "gun laws are slipping away", and should be strengthened further. But others, such as the Sporting Shooters Association of Australia (SSAA), say regulation efforts should focus on the illegal market rather than licensed shooters. "The SSAA will always support measures that genuinely contribute to public safety," the group told the Australian Broadcasting Corp in response to Gun Control Australia's report. "We will not, however, sit back while radical fringe groups dictate policy on the basis of fear and emotion, instead of scientific evidence and commonsense." The state government and police have emphasised that the investigation into Friday's tragedy remains in its early stages. However, Premier Mark McGowan described Australia as "an example to the rest of the world" about the need for strict gun laws. He added: "In this case, it appears, all of the firearms involved were licensed and there was the appropriate management of those firearms as best you can. "It was a farming property. In some ways there's not much else that I can see from the outside that could have been done."